Another legend surrounding Booz and his bottles is that the log cabin shape was derived from a supposed quote by William Henry Harrison in his 1840 election contest for that he would “rather sit on his front porch sipping whiskey than run for President.” His opponents used the comment to slur him. As the story goes, Harrison turned it around and offered free bottles of whiskey in the shape of a log cabin (his birthplace) widely available to the electorate. 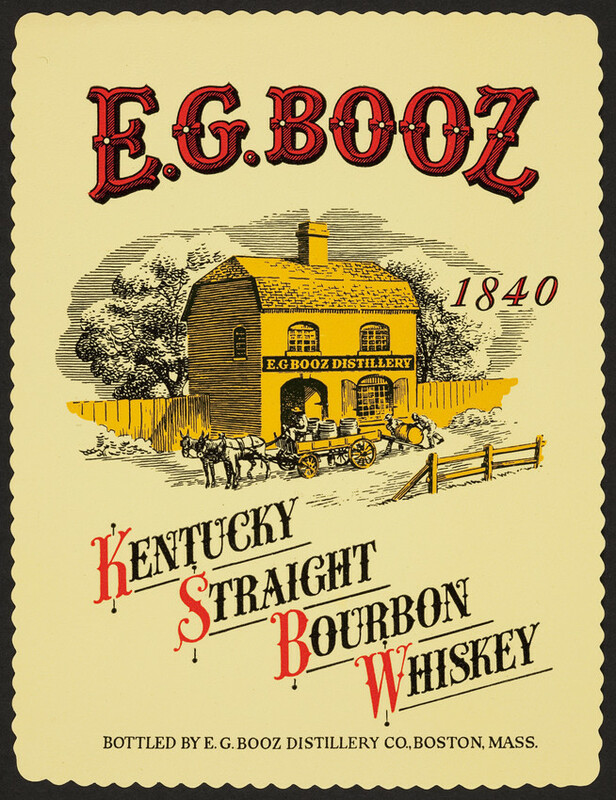 Well maybe, but Edmund Booz was only sixteen years old at the time and likely not at the helm of a Pennsylvania distillery. While the real story of this whiskey man may be more prosaic than the legends, it is worth reciting. 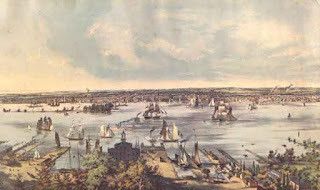 Booz was born in 1824 in Bucks County, Pennsylvania. His parents were William and Alice Green Hewson Booz, both of them born there. His father worked the land and like many farmers at the time may have run a small distillery to use excess grain. Edmund appears to have been young when he migrated to Philadelphia, shown above in the 1850s. Nor was he much older when he started making whiskey in the big city. 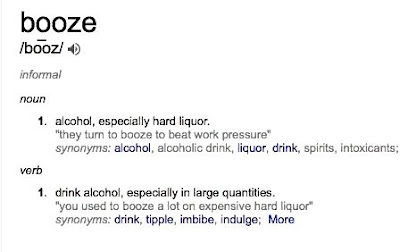 In time as his business prospered Booz entered a marriage. 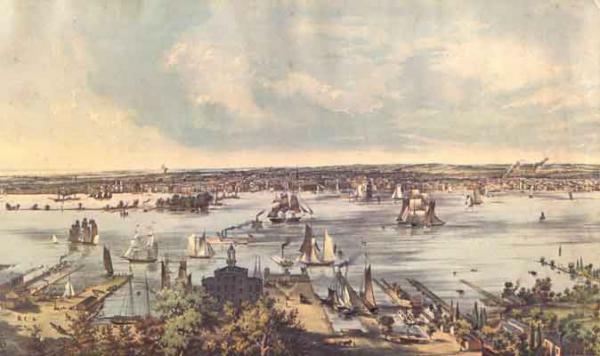 His wife was Catherine D., a woman 12 years his junior who had been born in Philadelphia. History records two son, Charles, born in 1857 and Andrew, born the following year. 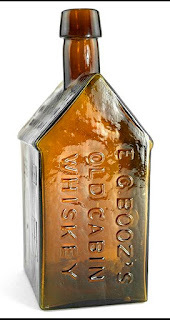 The year 1858 often is cited as the first year of manufacture for the famous log cabin bottle. By this time, Booz was selling his whiskey from a storefront at 120 Walnut Street to liquor merchants and tavern owners throughout the Delaware Valley. The Whitney glass works had a retail office in Philadelphia next door to him at 118 Walnut. We can imagine Edmund walking over there with an idea for a whiskey bottle and being warmly received. 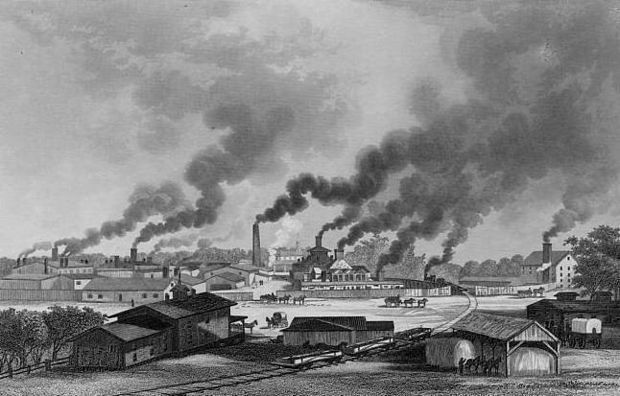 Shown below, the Whitney Glass Works in Glassboro, New Jersey, was one of the largest and most accomplished glass and bottle manufacturers in America. Even so, Booz’s log cabin must have posed challenges. The bottle with its squared edges and embossed windows, doors, roof shingles and writing on many sides, would have required great skill from the workers. 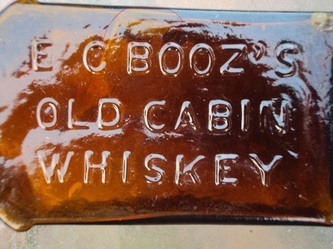 It was difficult to blow sufficient glass into the corners and crevasses of Booz’s containers and they often are found with damage because of the thinness of the glass at those points. The key to the bottles being feasible at all was a mold that was hinged to open and close diagonally. A treadle mold was used applying foot power to allowed the master blower to close the mold around the blob of glass as he was blowing into it and then allowed him to open the mold carefully as he was finished making the bottle. Excess glass was then cracked off and the top applied. 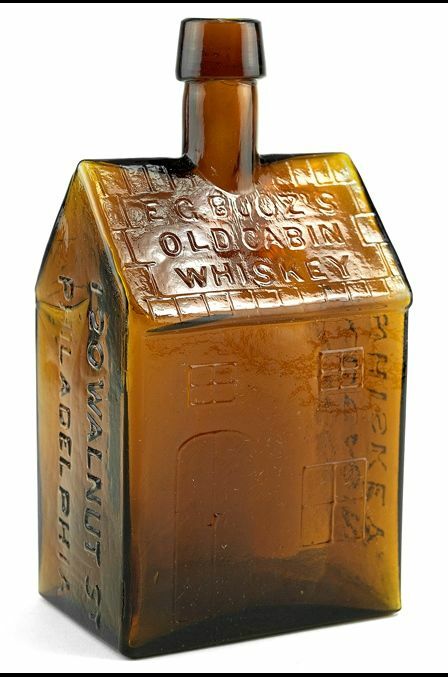 The original bottle also would have had a paper label wrapper, one that depicted an early American cabin, shown below in a reproduction. 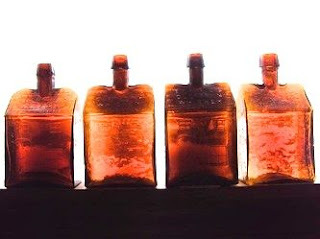 The Whitney Glass works appears to have produced these bottles for as many as 12 years, reputedly into the 1870s. As a result, although reasonably rare, many versions fetch under $10,000. Over the years Booz bottles have been reproduced by other glass houses, however, and collectors must be aware of the differences in the later versions that are valued much less highly. 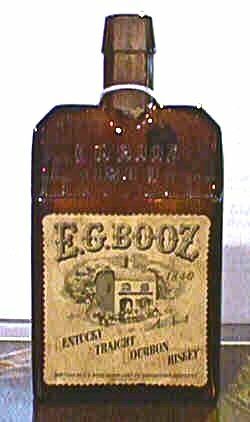 Meanwhile, the 1860 census found Booz and his small family living in the First Division of Philadelphia’s 14th Ward, his occupation given as “liquor dealer” but his name errantly given as “Edwin” and an incorrect birthdate. A clear sign of Booz’s affluence was the net worth he reported of $4,000, equivalent to $100,000 today— twice as much reported by any of his neighbors. Another indication were the two female servants in the household. 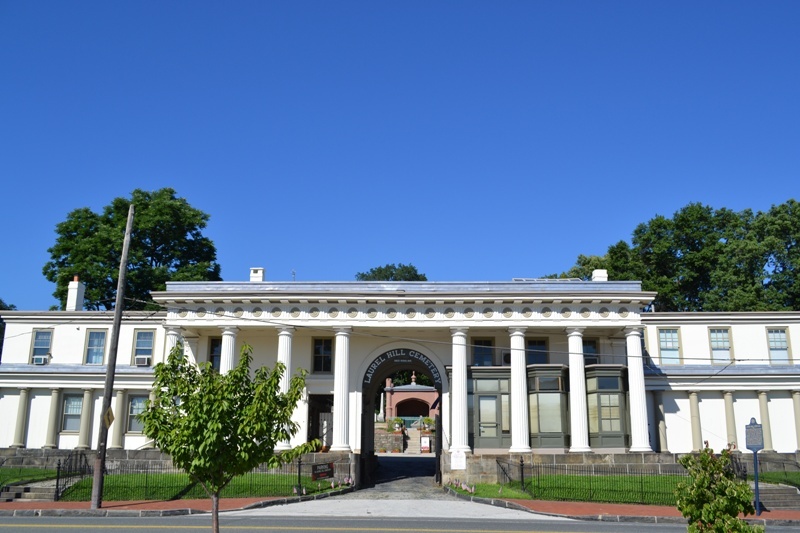 By this time in addition to his store on Walnut Street he was listed with an address at 15 Granite, possibly operating as his distillery or "rectifying" facility. 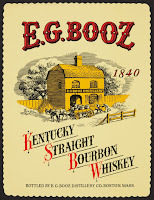 Having given the world an iconic bottle, Edmund Booz died young, only 46 years old in 1870. He was buried in Laurel Hill Cemetery, shown left, a graveyard that holds the remains of many of Philadelphia most notable whiskey men. Buried with him is his son, Charles, a railroad conductor, who died at only 30 years of age in 1883. Strangely, Catherine Booz, who died in 1914, is not buried with her husband or son, but lies in the Saint James Episcopal Churchyard in Bucks County, the resting place as well of Booz’s parents, William and Alice. 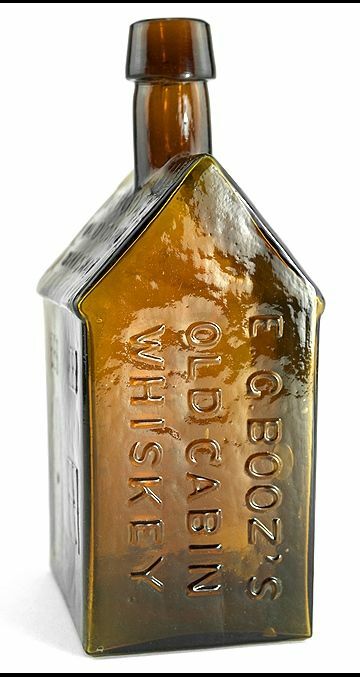 In summary, Edmund Booz may not have given us the word for "alcohol, especially hard liquor" as defined earlier, but he left a notable legacy of his own in the iconic log cabin bottles that contained his own, ah, hard liquor. Jones Morris: Thanks for the compliment. I am not willing to sell ads on my site because it would complicate my relationship with a number of people on whom I rely for information. I have opened your address and speculate that you are in the bottle business. 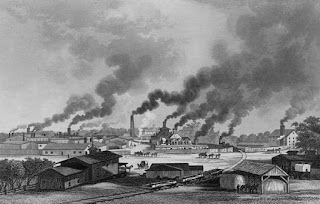 Have always found that fascinating, having worked briefly for Owens-Illinois many years ago -- writing about glass for various company publications and purposes. PA Digger: Good question. Copies do exist of the Booz cabins. Being no expert myself, I suggest finding one to consult. If the genuine thing you have a real find. Are you aware of EG Booz ever living on W. Mechanic St on the canal in New Hope PA in what later became the Towpath Restaurant? It's about to be torn down. Many years ago I read it was his home at one time, but I can no longer locate where I read that. I know he was from Bucks County PA. Thank you.